Le panneau d'"Options des Outils" présente les options disponible que vous pouvez appliquer à l'outil actuellement sélectionné. Pour les outils pouvant créer plusieurs calques, le panneau affiche de manière contextuelle les options disponibles suivant le type de calques choisit. L'icône du panneau "Options des Outils" change lors vous changez d'outil pour indiquer l'outil actif. Les valeurs du panneau d'"Options des Outils" sont enregistrées lors d'un changement d'outils mais également entre les sessions de SynfigStudio, ainsi, vous pouvez les réutiliser autant de fois que vous le désirez. Verrouiller Proportions : Permet figer le ratio x:y de la sélection courante de poignées. 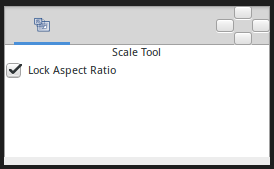 Allow Scale : Allow the selected Handles to be scaled and rotated at the same time. Star Points : The number of peaks of the star. Offset : The rotation offset of the created star. Regular Polygon : Whether create a regular polygon instead of a star. 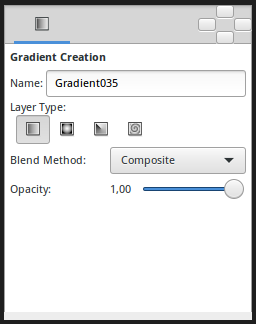 When you select the Gradient Tool, the Panneau Options des Outils will show the options for the Gradient Tool. 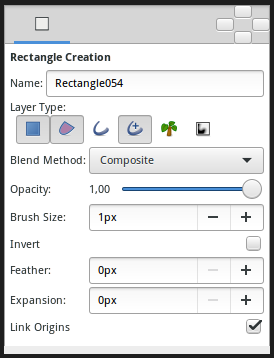 Name : Set a name for the layer you are about to create. The name of the layer can always be changed later via the Panneau Calques or the Panneau Paramètres if necessary, but the type of gradient needs to be chosen now. For help with editing gradient colors see the section on Dialogue de l'Éditeur de Dégradé. Min Pressure : The value of this option clamps the lower end of the Pressure sensitivity to a specific value, essentially determining how thin the thinnest possible segment is relative to the Brush Size parameter in the Toolbox. 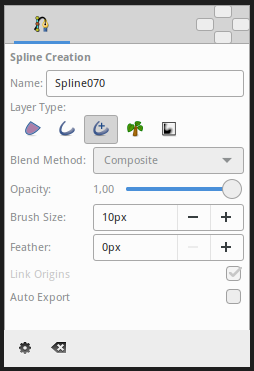 Width Max Error : for advanced outline layer. Round End : The ends of the spline will be rounded, only for Outline, Advanced Outline layers. Auto Loop : When the stroke of the "Draw Tool" ends near the beginning of the stroke, automatically connect the last Handle to the first. Auto Link : When the stroke begins and/or ends at or near a vertex Handle in another outline, and the outline isn't being extended by the "Auto Extend" option above, the first and/or last vertex of the resulting outline is linked to the Handle on the existing Outline Layer. 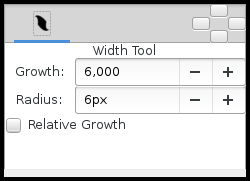 Growth - Defines how much a single mouse move will affect the line width. It must be non-zero for this tool to have an effect on the spline. Radius - Defines the size of area around current cursor position in which a vertex will be affected. It is allows you to achieve a noticeable effect without having to follow the line precisely with the mouse. The Width Tool works fine on splines with lots of segments (such as those created with the Draw Tool), you will see it works on more than just the first vertex. It is a full circular area, other points may get in the way though. Relative Growth - Doesn't really work very well unless the "Radius" parameter is set to some huge value (like a million). "Multiline Editor" - whether to use a single or multi-line editor for entering the text. If a single line is used then the ↵ Enter key will submit the value. In the multi-line editor, you'll need to click the "OK" button with the mouse to confirm the text or hit Ctrl⇆ Tab to give focus to "OK" button. 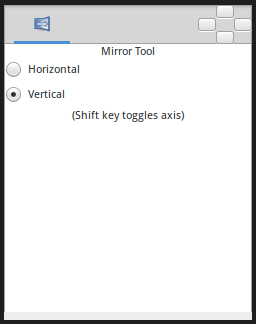 Show Sketch: a checkbox for toggling the visibility of the sketch overlay On and Off. Undo Last Stroke: cancels the most recent edit to the sketch overlay. Can be repeatedly clicked to cancel more edits. 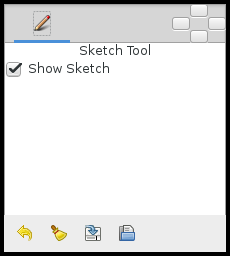 Clear Sketch: clears the current workarea's sketch overlay. Save Sketch As...: writes the sketch overlay from the current workarea to a .sketch file. Open a Sketch: loads a previously saved .sketch file, overwriting any previously drawn or opened sketch in the current workarea. 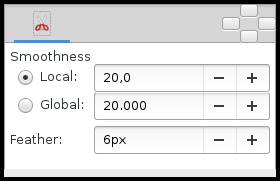 Sketch uses the color of the default "foreground color" in the Toolbox. 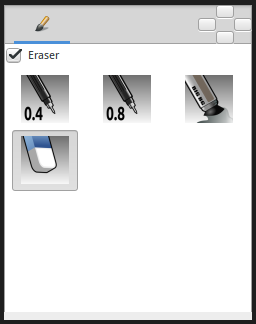 Eraser check box. When checked, the brush act has a rubber. 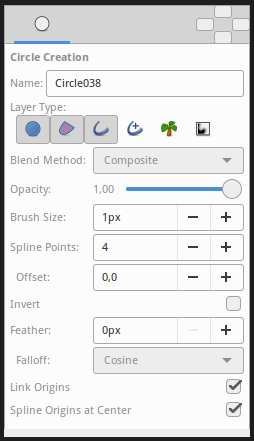 Display the set of configured brushes (MyPaint brushes format). 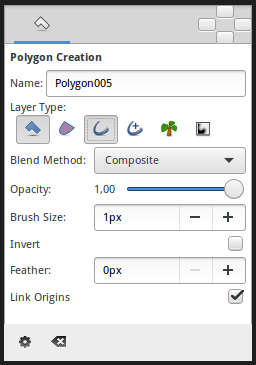 By default, synfig is installed with a selected set of brushes from "Concept Design (C_D)" pack by Ramon Miranda. 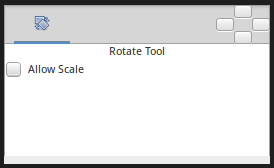 The "Brush Tool" uses the color of the Outline Color and the Brush Size set in the Toolbox to paint. This page was last modified on 20 April 2017, at 07:48.